← Was My Gmail Hacked This Morning? Google Analytics is an excellent analytics program for webmasters to keep track of website statistics. Google has a winner with this free tool for webmasters and I use it on every site I run. It offers a myriad of features and I hardly use maybe 50% of the features in there. I like to spend more time playing with new web apps, software and digging up tips & tricks rather than pouring through little data point in Google Analytics. Google Analytics opened up their Dashboard API and we are just starting to see developers putting that to good use. Trakkboard is an Adobe AIR app that lets you add Google Analytics widgets in a tabbed interface so you can create your own customizable Google Analytics Desktop Dashboard. One of the great features of Trakkboard is that it can individually query each of these metrics in a time interval you mention – like 20 mins, 30 mins, 1 hour or 2 hours. This dramatically reduces the time it takes for you to see your stats which traditionally has been the next day in Google Analytics. Google Analytics dashboard offers a nice way to take a quick look at all the stats but I might do that once a week. But, with a desktop tool like Trakkboard I can see myself firing it more often to take a quick look at how my sites are faring during the week and make adjustments. 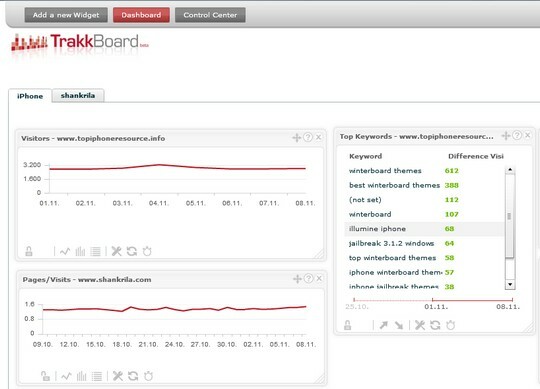 Plus, if I had multiple Google Analytics account I can bring them all together into one interface with Trakkboard! Trakkboard is in beta now and you just need to register to receive a license key and it is FREE! Looks very impressive but I’ve tried it any I’ve changed my mind. It just didn’t sit right with me. When I installed it it was laggy and after I entered all the parameters it didn’t want to work for no apparent reason. Maybe I was doing something wrong but why have that when you can access Analytics from your Google account? .-= Gordon Cindric´s last blog ..CSS For Absolute Beginners =-.